Welcome to our Bookkeeper Jobs site. The purpose of this site is to provide a frequently updated list of jobs currently available in the United States. We provide a list of jobs for each state. Our lists come from RSS feeds provided by the most popular job sites. 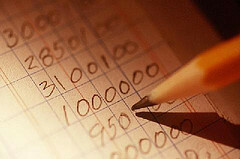 If you are a bookkeeper and you are seeking employment, this site should be useful. The following data should be interesting to the bookkeeper who resides within the United States. This data comes from the Bureau of Labor Statistics. Bookkeepers are required at a minimum to have at least a high school diploma, and increasingly more companies and business entities are requiring at least some college or an associate degree. The associate degree should be in either business or accounting. A bachelor’s degree is usually not required but many potential employers will take on an individual with the 4 year college degree with the premise that the employee will make an effort to advance within the company. On-the-job training is one of the most important components of preparation to become a competent bookkeeper. Potential employers also prefer previous accounting work experience, and knowledge of common spreadsheet applications is also preferred. Also, obtaining the Certified Bookkeeper (CB) designation is a plus, and many larger and some small companies prefer that you have this designation. The Certified Bookkeeper (CB) designation is awarded by the American Institute of Professional Bookkeepers and presents to the potential employer knowledge and competency in basic bookkeeping functions, including overseeing payroll and balancing accounts. So if you are a Certified Bookkeeper, this puts you in a much more competitive position when seeking employment. For more information about education required in the United States for the bookkeeper go to Occupational Outlook Handbook provided by the Bureau of Labor Statistics. The bookkeeper job outlook looks pretty good. Growth of bookkeeping employment is expected to be around 12% between 2006 and 2016, which is considered average relative to all other occupations. But more importantly, 264,000 new bookkeeping jobs is expected during the projection decade of 2006 to 2016, which is higher then most other occupations. This is due primarily to the large size of this occupation. Every business or company needs to have a competent bookkeeper, coupled with the fact that many bookkeepers are expected to retire, means that the bookkeeping job will be in high demand. Even when times are tough, and companies are trying to reduce expenditures, bookkeepers are the last to get laid off simply because they are an essential component of a viable company. The best job prospects will be seen for those individuals who are a Certified Bookkeeper, and have several years of accounting experience. Of all the top interview questions, this one is about as old as the hills and just about as irritating. What are you supposed to say to this? Are you supposed to start at first grade and come all the way forward? Are you supposed to focus on your education, your experiences in business, your goals? Afterall, you don’t have all day. Your interview could last less than an hour and this is just one question. The answer is yes, but you do it in such a way as to highlight the important periods in your life that guided you in the direction you are currently pursuing. Where did you come from – what kind of environment did you grow up in? What caused you to pursue the field you are in? How did you decide upon your education and how you would receive your training? Has it been fulfilling? Are you looking for bigger challenges? What would you tell your best friend if they asked you this question?